71 Inf Div undertook a white water rafting expedition from Marjung La to Bhalukpong with National Institute of Mountaineering & Allied Sports (NIMAS) covering a total distance of 121 km with 51 rapids in treacherous Kameng River over a period of seven days from 27 Jan to 02 Feb 2017.The aim of the expedition was to develop spirit of adventure, inculcate leadership qualities, camaraderie and esprit-de-corps amongst army personnel. The expedition was flagged off by Maj Gen Alok Raj, GOC, Blazing Sword Division on 27 Jan 17 and flagged in by Lt Gen A S Bedi, YSM, VSM, GOC, Gajraj Corps on 02 Feb 17 with the aim to develop spirit of adventure, inculcate offensive spirit, camaraderie & esprit-de-corps amongst all ranks. Interaction with local population and civilian dignitaries was also carried out as part of perception management. The total strength of expedition was six officers, one JCO and 28 OR. The expedition was carried out under the dynamic leadership of Lt Col B N Jha & Lt Col Surender Singh. Apart from inculcating the spirit of adventure & esprit-de-corps ,the expedition team also interacted with the Ex-Servicemen (ESM) enroute & also gave useful inputs to locals & civilians about the opportunities in army and also learned about the local customs & traditions. The expedition team also gave a glimpse and insight about the environmental awareness to the local populace. One of the key objectives of the expedition was to ensure operational orientation, in still offensive spirit & training in riverine terrain. 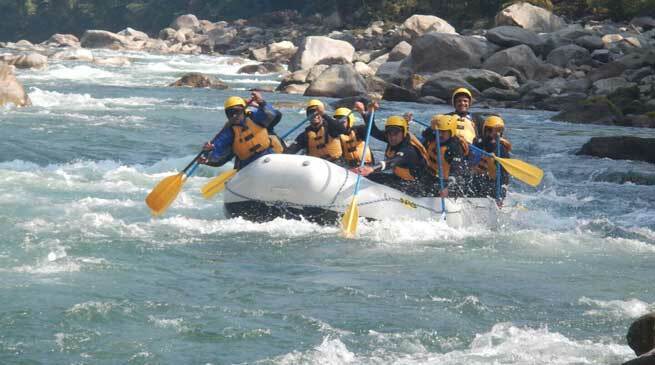 Intense preparation & training was carried out by the expedition team wherein the basics of white water rafting were learnt at Army Aqua Nodal Centre (AANC), Nimmu & the advance training was carried out with National Institute of mountaineering & Allied Sports (NIMAS).